Anglicans in Christchurch are talking about sharing a cathedral with the Catholics, a move that would have worldwide ramifications. Rebuilding Christchurch’s two wounded cathedrals into one ‘unprecedented’ Anglican-Catholic super-cathedral is under discussion at top levels in the Anglican Church. The Sunday Star-Times understands the possibility of an ecumenical, or joint, cathedral to unify the two churches has been discussed behind closed doors for months. If given the green light, it would bring the Catholics and Anglicans together under the same cathedral roof for the first time in the world since the churches split in the 16th century. Christchurch’s Bishop Victoria Matthews was reluctant to speak publicly about the controversial idea for fear it would ‘kill the possibility’. But she confirmed she had informally discussed it with local Anglicans. ‘There are conversations about this going on, but those conversations are with ourselves,’ she said. The idea had not been raised officially within Christchurch’s Anglican Diocese, was yet to be broached with the city’s Catholic leaders and was currently only an Anglican ‘hope’. ‘It’s fair to say there are many individuals in the diocese who would welcome the idea,” Matthews said, adding that while the Christ Church Cathedral demolition was before the High Court, the ‘delicate conversation’ had been put on hold. Matthews said the Anglican Church would patiently wait for the ‘right moment’, rather than ‘raising the question at the wrong moment and it’s dead in the water’. If the super-cathedral was accepted it had the ‘potential of being huge’ for Christianity worldwide, not just Christchurch. Ahead of Judaism’s High Holy Days when hundreds of thousands will visit the holy site, engineers inspect Western Wall to ensure stability • Office of the rabbi of the Western Wall confirms that site is safe and ready to receive the faithful. A team of engineers closely examined Jerusalem’s Western Wall — a remnant of the ancient Temple destroyed in 70 C.E. — on Tuesday. The inspection is carried out annually to the check stability of the site ahead of the High Holy Days. With less than two weeks to go before the Jewish New Year and the start of the most important days in Judaism ahead of Yom Kippur, when hundreds of thousands of people are expected to visit the site, engineers examined the ancient stones. The office of the rabbi of the Western Wall, Rabbi Shmuel Rabinovitch, said there were no abnormal findings in Tuesday’s test. Tests in previous years have uncovered stones damaged by bad weather, but no problems were found this year. In 2003 an engineering survey of the Western Wall was undertaken on behalf of the Israel Antiquities Authority which mapped the stones in the wall and physical problems, and undertook to monitor the state of the wall’s preservation. A survey by engineers in 2009 spotted detached building material and found that stones in the upper courses of the wall were in danger of falling. Conservation efforts were undertaken to remove hazards and stabilize the original stones. The wall was stabilized and annual maintenance is now carried out to monitor the situation. UPDATE: Ordinariate Ordination Report here (with photos). Well, the service this morning went for two and a half hours! That was due to a combination of factors, eight ordinands + more than a hundred ordaining priests (I didn’t count them – and I am not good at estimating numbers). The laying on of hands and the greeting of peace – two separate rites within the ceremony – took ages, as each ordaining priest laid hands upon / greeted each ordinand. The ordinands were (for Melbourne) Andrew McCarter, Benneth Osuagwu, Jerome Santamaria, and Kevin Williams; (for the Ordinariate of Our Lady of the Southern Cross) Neil Fryer, James Grant, Christopher Seton, Ramsay Williams. Archbishop Denis Hart was the ordaining minister, and Father Harry Entwistle, the Ordinary of OLSC, was the first of the presbyters to lay on hands after the Archbishop. A suprise visitor and concelebrant (he wasn’t listed on the program) was His Eminence George Cardinal Pell, Archbishop of Sydney. Just a reminder: 8 candidates will be Ordained to the Priesthood at St Patrick’s Cathedral, Melbourne (on the feast of the Nativity of the Blessed Virgin Mary), today. 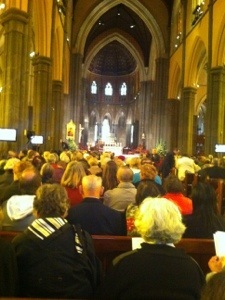 4 candidates are from the Ordinary of Our Lady of the Southern Cross and 4 from the Archdiocese of Melbourne. It’s about half an hour yet, but the excitement is building towards today’s ordinations in Melbourne for the Ordinariate of Our Lady of the Southern Cross. Full report after the event! The Anglican Church is drawing up plans for a historical overhaul that would see the introduction of a ‘presidential’ figure to take over some of the global role of the Archbishop of Canterbury, Dr Rowan Williams has revealed. Last night Bishop Mouneer Anis, the leader of Anglicans in the Middle East and North Africa – who is chairman of the Church’s leaders in the so-called “Global South” welcomed the suggestion. More with a video interview here. The CofE has been ‘wrong’ about far more than ‘homosexuality’ in the past. Listening to Archbishop Rowan Williams, it reads more like 20-20 hindsight on display… And history will not look on him kindly.